Newsletters are a powerful marketing tool for both building relationships with customers and boosting sales. In fact, email marketing converts 66% of online consumers, beating social media, direct mail, and other channels. But your newsletter can only effectively convert visitors if they’re on your mailing list, and a friendly newsletter pop-up upon arrival to your site is good encouragement to join. 1) Be clear about what the visitor receives when they sign-up. When explaining to people what they will receive, clarity is king. Building trust comes from being straightforward and transparent, so let your audience know exactly what to expect from you. Giving specific details is comforting because it takes any fear or risk of losing control out of the equation. When your visitors know how often they’ll be receiving an email, it feels more like a welcome friend than a surprise guest—and they’ll be ready to respond to your blog content or sales pitch. 2) Offer them a chance to win a free gift. People base their evaluation of brands primarily on their emotions rather than information, so creating a feeling is one of the most effective ways to get customers to buy in. And you know a quick and easy way to create enthusiasm? That’s right—the chance to win. The urge to win is strong, and most people will have a hard time resisting that anticipation. Plus, offering a giveaway of a free gift also portrays your brand as fun and exciting and implies that the same is true of your newsletter. Who wouldn’t want to be in the loop with a lively, vibrant company? 3) Be generous—give them something in exchange for their email address. In the early days of marketing, a competitively low price was enough to attract product sales. Today, consumers are prioritizing relationships with brands—they want to feel valued and understood before they buy in. Don’t just talk the talk, walk the walk. Show your customers how much you value your mutually beneficial relationship by offering something in exchange for their email address. Knowing what your audience wants—and then providing it—proves that your company listens and cares about its customers. Your offer can take the form of knowledge (especially if you’re a B2B company), like an exclusive “Three Steps to a Better Conversion” infographic. Discount codes are another tried-and-true incentive for visitors to provide their email. As long as your offer matches your customers’ priorities, you’re sure to see your mailing list grow. 4) Give them the promise of value. 70% of email readers look for deals, discounts, and coupons when opening emails from a brand or company, but that’s not the only value you can offer your newsletter subscribers. Does your newsletter regularly give insider tips or industry secrets? Do you host monthly giveaways or invite your readers to exclusive events and webinars? Make your visitors aware that by providing their email address, they will be rewarded. And once you’ve guaranteed value, deliver it. Fulfilling a promise subconsciously creates trust, which in turn makes your subscribers more likely to read and act on your newsletter’s content. 5) Make them an insider. People crave the feeling of belonging, so hone in on the element of community to attract sign-ups to your newsletter. Make your mailing list feel like an inner circle, including offering perks of membership like exclusive discounts or free programs. When your readers feel part of something bigger, they’re more likely to stay on your list and support your business activities and goals. Email marketing is one of the most effective tools to boost brand awareness, customer retention, sales, and lead generation. 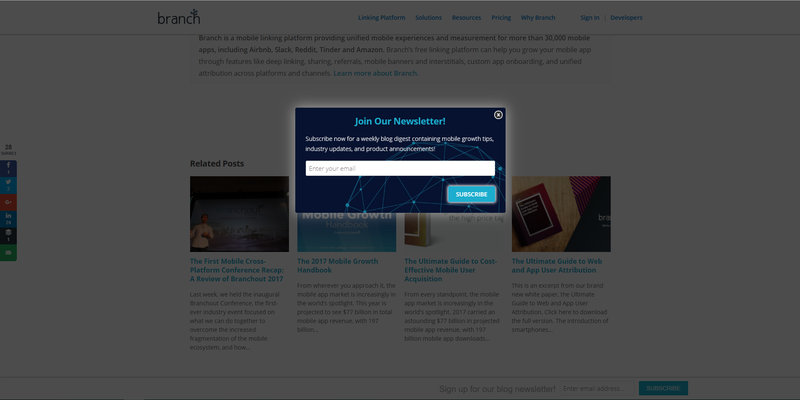 42% of B2B organizations find email to be the best way to target new clients—and a pop-up that is clever, clear, and convincing turns your website’s visitors into newsletter subscribers. With these tips, your mailing list will grow like never before.